The schooner Adventuress was built in East Boothbay, Maine, in 1913. She is 133' long overall and 101' on deck. During day sails, she can carry a maximum of 60 "souls"—45 participants and 15 crew. The image below was taken by participant Laura B. as she climbed in the rigging during an overnight trip. It shows a portion of the deck aft of the mainmast. At the bottom center you can see Adventuress' dinghy, Ayashe, which is full of fenders that the crew use to help Adventuress get safely on and off the dock. You can also see the wheel (a participant is at the helm under the guidance of the Captain), the butterfly hatch skylight that looks down onto the main cabin, and the companionway that leads below decks. For a detailed representation of Adventuress' deck layout, click here. On overnight trips, Adventuress sleeps thirty-seven. Participants sleep in either the Main Cabin (sixteen bunks) or the Foc'sle (twelve bunks). There is also a Crew Cabin (four bunks) and the Captain's Cabin, as well as four convertible bunks in the Deckhouse that crew use when the ship is at capacity. The bunks have foam mattresses, but we ask you to bring a sleeping bag and small pillow. There are no showers aboard the ship. There are three heads (marine toilets) that are located in the passageway between the main cabin and the foc’sle (this passageway is affectionately referred to as the "Bowling Alley"). Each head has a toilet and a sink. 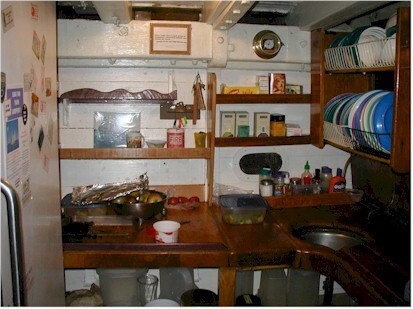 For a detailed representation of Adventuress' below deck layout, click here. The Main Cabin has bunks in tiers of three and sleeps sixteen people. 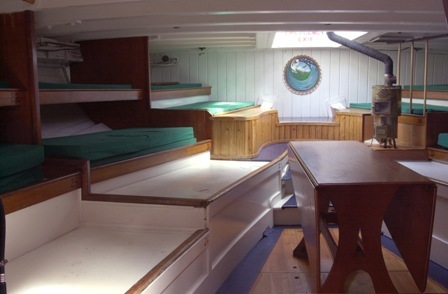 During the day, participants store their gear in the upper bunks and the lower tier becomes bench seating around the central table. The Main Cabin is where we share meals, lessons, and nightly performances and presentations. The foc'sle (short for "forecastle," i.e. 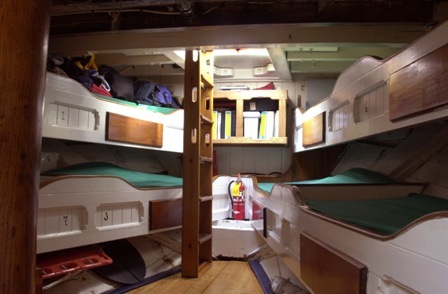 the cabin forward of the foremast) has bunks in tiers of two and sleeps twelve people. The Galley Coordinator prepares three meals a day in the galley, a small, cozy space that separates the foc'sle from the main cabin. We serve only vegetarian food due to the nature of our galley, which has limited cold-storage capacity. Eating lower on the food chain is also consistent with our mission. 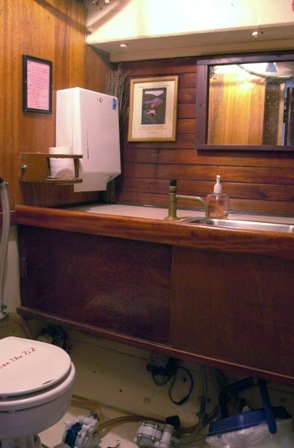 Adventuress is equipped with three heads (marine toilets). If you're not familiar with how marine heads work, don't worry! They're not scary, and a crew member will give you an introduction on how to flush.